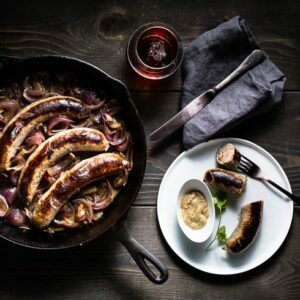 This is one of the simpler and most delicious bratwurst dishes to make and it takes just one-skillet and 20 minutes. Fabulous for a weeknight or a party. Oktoberfest might end in the middle of October, but this is one I like to keep around all year. Do you love brats as much as I do? This is one of the simpler things to make and it takes just one-skillet, 20 minutes and they come out perfect every time. It’s a fabulous weeknight meal or is perfect for your Oktoberfest or football party. Bratwurst is a German sausage that is most commonly made with Pork. 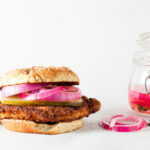 This is the low-carb version with no bun, but you can definitely use a bun if you prefer. 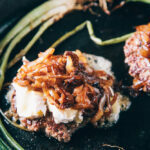 Serve it with an Oktoberfest beer or German-style lager. 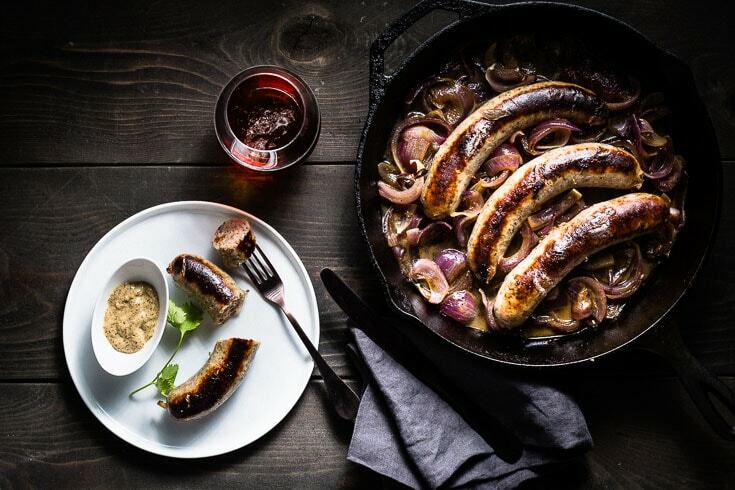 There are a lot of ways to cook Bratwurst sausage. You can boil, roast, grill or steam them. The best method is to brown them in a skillet, then add some liquid and cover to steam. Everyone that tastes these sausages raves about how perfect they come out and can’t believe how easy and quickly it is ready. If there is water left in the skillet after the brats are finished cooking, you don’t need to worry about reducing it down. You just want the onions to be cooked and soft. Heat a large cast iron skillet with a drizzle of canola oil over medium-high heat until it just starts to smoke. With a fork, poke a few holes on each side of the bratwurst sausage to keep them from bursting while they cook. Place the brats in the hot skillet, then place the onions around them. Stir the onions to spread them around and to coat with oil. Cook the brats for about 4 minutes per side, or until they are nicely browned. Carefully pour 1/2 cup water in the skillet, then immediately cover and reduce the heat to medium-low. Cook covered for about 10 more minutes, or until the internal temperature reaches 160 degrees. Remove the lid and the brats from the skillet. Increase the heat and season the onions with salt and continue to cook the onions for a few more minutes to reduce the liquid. 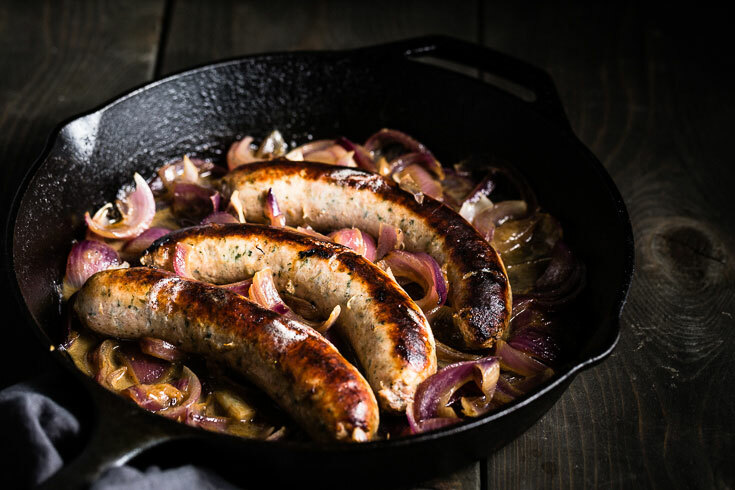 Serve the sausages topped with the onions and your favorite mustard. You can substitute stock or beer for the water, but it's not necessary. 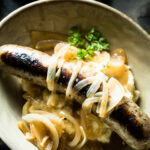 The most comforting dish of bratwurst sausage with a super flavorful onion gravy and buttery mashed potatoes. 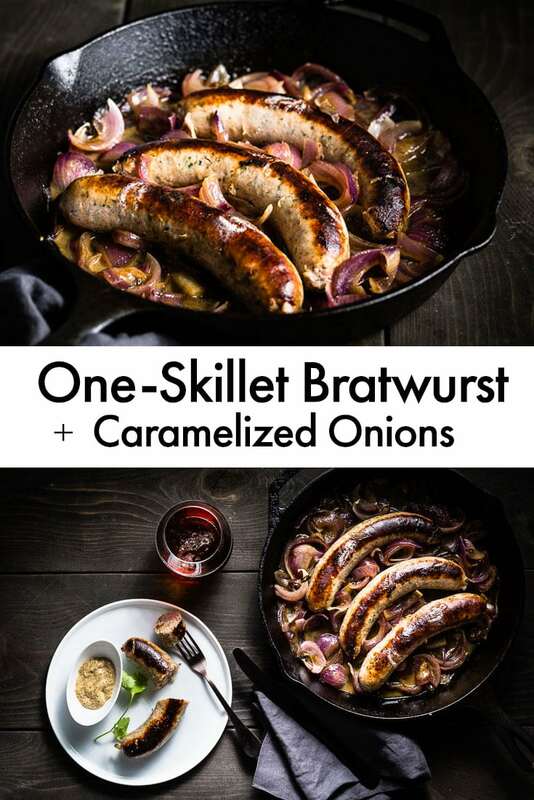 Love this one, probably my favorite way to make bratwurst now! I used to just grill them but they would always come out way too dry and loose a lot of the flavor in the process. These have been a hit with the family and friends every time. Just watching this video makes me hungry again! 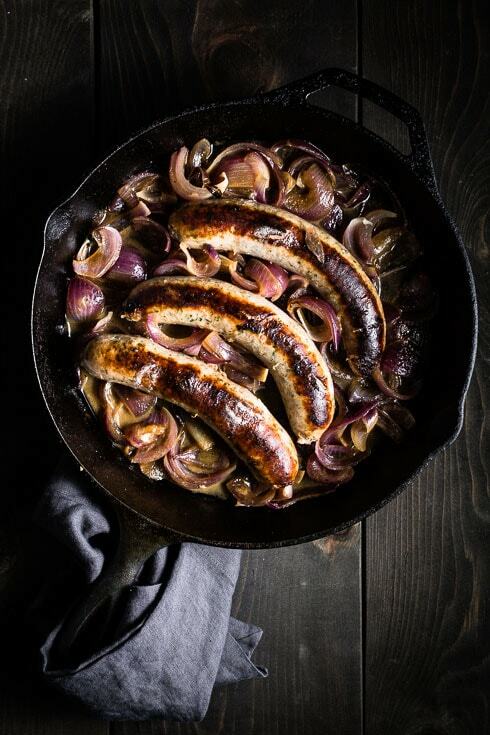 This is one of the absolute best ways to cook Brats. Simple and fast with every bite full of absolute goodness. I won’t cook mine any other way again. So good! Did them for the second time tonight and they were perfect both times. I doubled the onions the second time because they shrink and we love them. That makes me so happy to hear! This is probably my favorite go-to weeknight dinner when I want to cook and eat something delicious and want it quick and easy. Cheers!